Paul Pogba netted his first goals in almost two months against West Ham, albeit from the spot, but though the win over West Ham was laboured, it’s still an encouraging sign and offers a confidence boost for the final push this season. The boys will need all the physiological benefits they can receive ahead of a trip to the Camp Nou, where Barcelona are utterly dominant in European fixtures. They’ve won a ridiculous 27 of 30 unbeaten matches there since 2013/14, with 22 of these victories coming by two goals or more as they netted at least three times on as many as 19 occasions. Meanwhile, we’ve lost four of our last six matches ahead of this clash, including all three on the road, though at least we found the net in the majority of these which offers some hope as an away goal could potentially alter the tie significantly. Barcelona are certainly a more direct outfit than they used to be, though they remain excellent in possession and enjoyed 66% of the ball in the first leg. However, that isn’t everything and teams have upset them before by absorbing pressure and then hitting them on the counter, and our weapons are certainly geared towards that kind of set up. With that in mind, rather than the cautious back three employed in the first leg, we’re hoping to see some natural width in attack to get at the spaces left in behind by Barcelona’s full-backs as they drive forward. 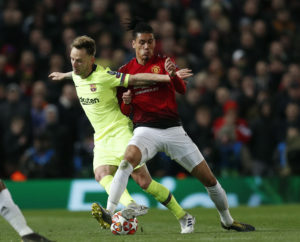 Meanwhile, Sergio Busquets had a tough time at the base of the Catalan’s midfield last week and was perhaps fortunate not to be sent off after a series of niggling fouls, but the 30-year-old has never been blessed with pace and could become a liability for the hosts if he picks up a yellow tracking back. Luke Shaw is going to be one well-rested man after suspension kept him out of the weekend clash with West Ham, while another rules him out here, and he’ll also be sidelined for our upcoming trip to Everton. 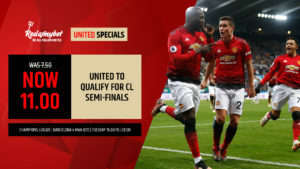 That will ensure Ashley young switches to left-back, with one of Matteo Darmian or Diego Dalot starting on the other side. Nemanja Matic and Alexis Sanchez should be returning to the squad, though only the former is likely to receive a starting slot against the Catalans – especially with Ander Herrera absent owing to a thigh complaint. Scott McTominay and Marcus Rashford were rested at the weekend and should be fresh here, while Jesse Lingard should probably start over Juan Mata for the energy he can provide. For the hosts, Ousmane Dembele made his first appearance in a month at the weekend and will battle Philippe Coutinho for a starting berth, while Arturo Vidal ma hope for a start after Barca’s midfield struggled last week. It’s going to be tough to repeat the comeback success in Paris six weeks ago, though with just one goal in it, anything is possible. This century alone, teams that have lost the first leg of a Champions League knockout tie 1-0 at home are just W1-D4-L12 in the return leg, but at least five of the six since 2009/10 saw both sides register on the board. Meanwhile, Barca have won six of their seven knockout games at home since 2015/16, but they only kept two clean sheets across these and we should at least be good for a consolation effort.